It's true, primavera vegetables are often the stars of this type of pasta dish. But we'd like to give a shout-out to the ham and creamy sauce in this one. Cook pasta in Dutch oven as directed on package, omitting salt and adding vegetables to the boiling water for the last 2 min. Meanwhile, melt butter in large saucepan on low heat. Add garlic; cook and stir 1 min. Stir in flour; cook and stir 2 min. Gradually stir in broth; cook on medium heat until mixture boils and thickens, stirring constantly. Add cream cheese, Italian cheese blend and 1/4 cup Parmesan; cook and stir 2 min. or until cheeses are melted and sauce is well blended. Heat oven to 375ºF. Drain pasta mixture; return to pan. Add cheese sauce and ham; mix lightly. 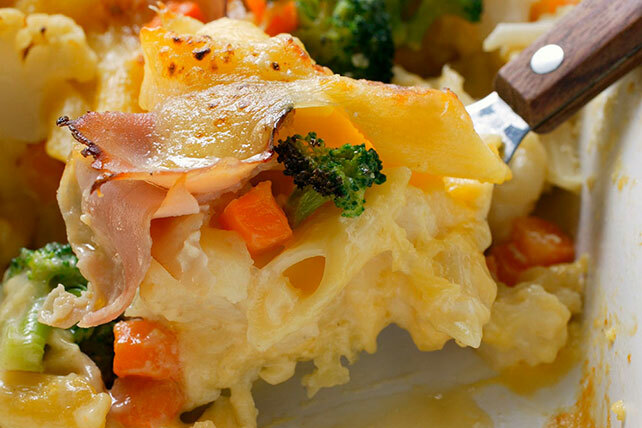 Spoon into 13x9-inch baking dish sprayed with cooking spray; sprinkle with remaining Parmesan. Add 2 cups small cauliflower florets with the broccoli and carrots.